As I was saying, unexpectedly all my weekend meals ended up being Biryanis, even though I cooked these over four different weeks. Until the last moment when I was checking the dishes, it didn’t strike me at all and it was already too late. I actually had a tiffin prepared, then decided that since one pot meals were ready, I might as well share these. This Egg Biryani was something I have been wanting to cook for a long time. When it comes to biryanis, its always either Chicken or Vegetables. That day when I had to cook for others, I thought I might as well make with eggs as they all like eggs. The masala was almost similar to what I make with minor changes. Best part was everybody wanted me to click the pictures before they could start eating. So you can imagine the behind the scenes as I was clicking the pictures. Each one was telling me how to plate and what else should be used as a prop. I was not able to include all of them. However I have them saved. Boil Egg to hard boil stage and keep it aside. Wash and soak the rice before you start to make the biryani. Grind the shallot, herbs and keep it aside. Heat a non stick pan with oil and ghee, add all the whole spices and saute well. Then add the onion julienne, and cook on high till the onions turn colour. Add the curds and mix well. Add the rest of the spice powders and cook on slow flame. Mark with knife on the eggs for the masala to steep in when it gets cooked. Add the shelled eggs to the masala. When you have cooked the masala for 5 more mins, add water and bring to boil. Now add drained rice and bring to boil. Roast the ginger garlic in another pan till well cooked and add to the boiling pan finally. Cover with lid and keep another heavy vessel over this. Keep this cooking pan over a tawa and cook on low flame for 15 – 20s. In the last 5 mins, roast the cashews in ghee and add to the pan. Cover again and cook for 5 – 10 more mins. 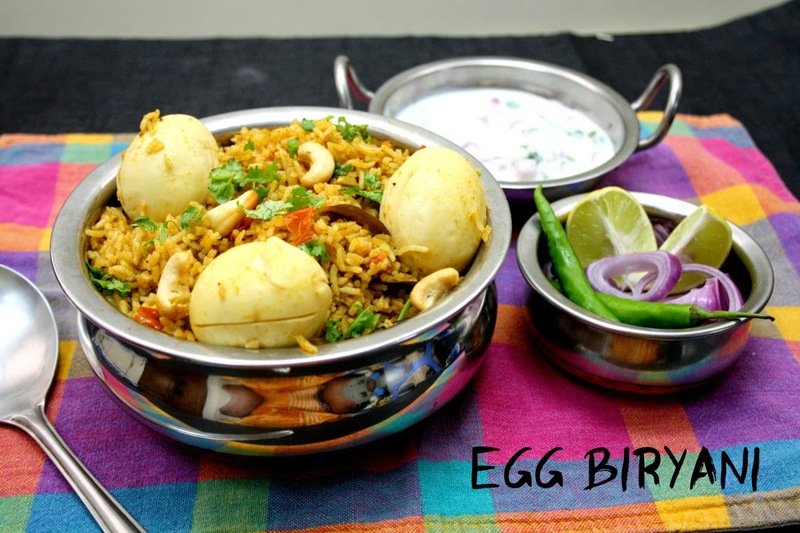 The egg biryani sounds interesting and i am sure will be relished by egg lovers. Briyani will always make the meal special!! Either it dinner or lunch!! You made it great and sure your family would enjoyed it lot .. Loved your presentation.You made it perfect. Bookmarked it & gonna try soon. With all the help you got the pictures look great and the props perfect. Nicely presented. I'm a big egg biryani fan. Your version with ground masala paste sounds absolutely delicious. Clicks turned out great. This dish is making me feel hungry, so delicious and tempting. Omg, this egg briyani is torturing me, inviting.. Thank you for the recipe. I created a vegan biryani based on your egg biryani. We all loved it!